“Floating Along” Acrylic on canvas. 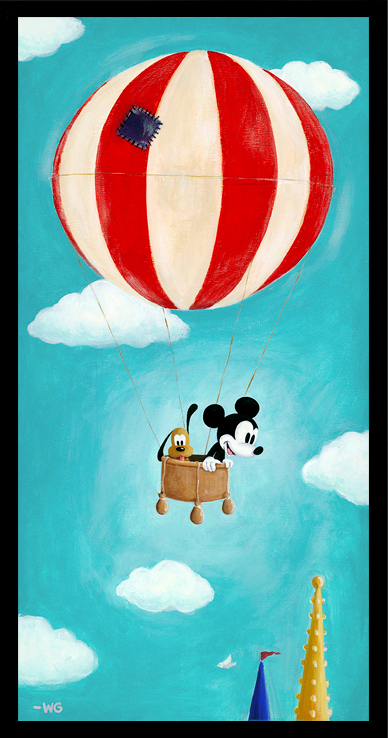 I love the idea of a couple of old pals floating up and away in their vintage style balloon so I just had to paint this piece with Mickey and Pluto. This piece will debut at the Festival of the Masters 2013. The show runs Nov. 8, 9, and 10th only at Downtown Disney in Orlando. The original painting and prints will be available the weekend of the show. I will also be there signing all three days. Hope you can come by and see it (and me) in person! I am from Canada near Toronto and I am trying to find a way to order this online for a friend who recently saw it and loved it. Is there any way to do that?